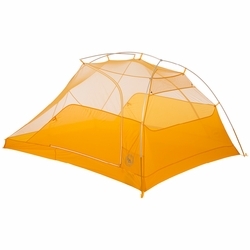 Big Agnes Tiger Wall UL3 Tent. The Tiger Wall UL tents are the lightest two door/two vestibule, technical backcountry shelters yet from Big Agnes. The two doors make tent life a little easier, and the weight savings is especially nice when out for multi-day trip and gram counting. Combining simple, yet strong single pole architecture with DAC Featherlite materials, interior storage pockets, and comforts around every corner, these tents are poised to be a backcountry favorite. Tiger Wall UL2 & 3 from Big Agnes on Vimeo.